On Saturday, the competitors played the Parkland Course at Legends. This is a great test of golf for all skill levels and the course was in exceptional shape for early March. 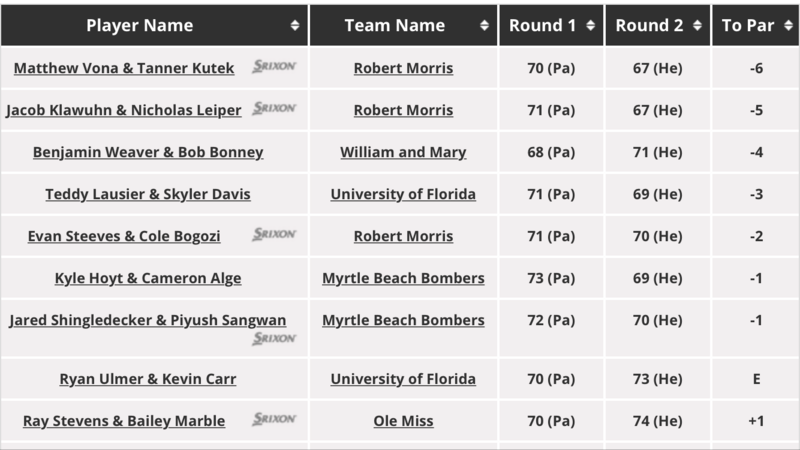 After the first round, Robert Morris and University of Florida were tied for the team lead at 141 with the Myrtle Beach Bombers and Ole Miss only four strokes behind. On the pair side of things, Ben Weaver and Bob Bonney from William and Mary came out and fired a 4 under 68 to take the lead as top pair. 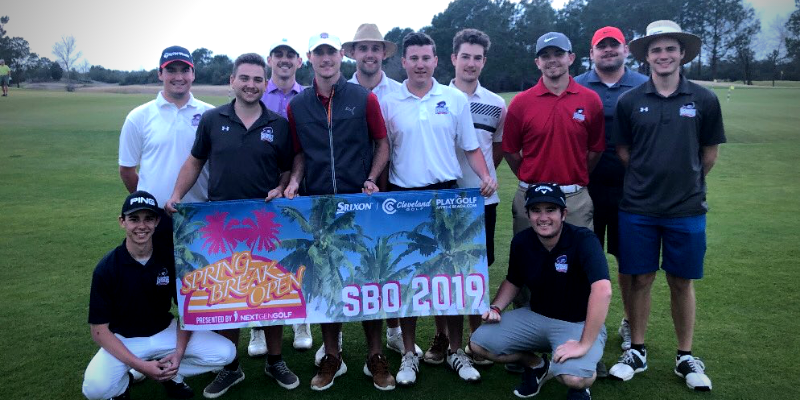 Right behind them was Tanner Kutek/Matt Vona (RMU/70), Ryan Ulmer/Kevin Carr (Florida/70), Cam Bullman/Kurt Stenson (Liberty/70), and Ray Stevens/Bailey Marble (Ole Miss/70). It looked like the makings of a great Sunday finish! The Heathland Course hosted Sunday's round, and the players shot even lower than day 1. Even with great day 2 scores, nobody was able to catch Robert Morris. The team shot 141-134 for a total of 275 and an eight shot victory. The six players that contributed scores were Tanner Kutek, Matt Vona, Cole Bogozi, Jacob Klawuhn, Evan Steeves, and Nick Leiper. For medalist pair, the title didn't go far as the RMU pair of Tanner Kutek/Matt Vona won with a two day total of 137 (-6) and a one shot victory over their teammates Jacob Klawuhn/Nick Leiper (-5). Thanks to all who participated in week 1, we can't wait to see what's in store next weekend.